Next to platform nine you will find some locally baked pizza. Maybe not the best but when I arrive in my hometown, I feel it’s the best. It’s a small family business and they make it like their own. I like railway stations. I can see a lot of type of people there and it’s very interesting. But most eating places in stations are terrible. This place is not. There are no chairs here; you can stand and watch and smell the railway station while you eat your pizza. Most international trains arrive at Keleti Pályaudvar railway station, which is just where most of my Hungarian trips (relatives, friends, etc) start from as well – yeah, it’s one big railway station with a beatufiful old building. When I’m hungry and in a hurry I have my favourite pizza slice here. 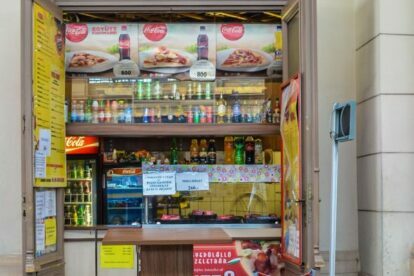 If I arrive in Budapest by train or if I’m waiting for my wife, the first thing to do is buy a slice here. I love this pizza. It’s a bit oily, but there is a lot of material in it, it can really fill me up!